by Michael S. Greve. Cambridge, Mass: Harvard University Press, 2012. 509 pages. Hardcover $39.95. ISBN: 9780674061910. Perhaps you, like Keanu Reeves in the film The Matrix, sit at your desk each day with the vague impression that something about the world is deeply wrong, but you cannot quite put your finger on the problem. Michael Greve, the John Searle Scholar at the American Enterprise Institute, would like to be your Morpheus. In this sprawling, idiosyncratic, and often frustrating book, Greve reveals The Truth: the problem, at least in the United States, is federalism, which has not merely run off the rails, but has become literally inverted, promoting what it was designed to prevent, and preventing what it was designed to promote. In a book that aspires to be simultaneously a work of political economy, constitutional history, and doctrinal critique, and that along the way also attempts a biting, corrective intervention into contemporary conservative constitutional theory, Greve explains how true federalism’s demise, and its replacement with an imposter, has caused such misery. Greve’s basic claim is that, over the course of the twentieth century, the Constitution was “revolutionized.” By this he means much more than the conventional, and undeniable, proposition that the meaning of important provisions of the Constitution, such as the Commerce Clause, changed over time. Instead, he means something much bolder and more specific: the most significant structural provisions of the Constitution, he argues, “have come to assume the opposite of their reasonable meaning” (p.2). Greve is quite serious about both aspects of this contention. 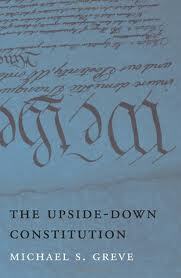 The Constitution, he maintains, has come to mean precisely the opposite of what it really means – hence the “upside-down” Constitution of his title – and that meaning is contrary to its only reasonable meaning. The upshot of this claim, of course, is that we now live in an era characterized by a particular kind of madness. It is not just that time and events have frayed or eroded the constitutional scheme, or that its administration by actual human beings in actual circumstances has resulted in its gradual evolution. No. The document has been turned cleanly upside down; we as a society have stepped through the looking glass to the other side. If the constitutional world seems insane to you, Greve brings good news: you are not the crazy one. The clarity and pungency of this message, and the consistency with which it is delivered, is the source of the book’s occasional strengths, but also of its considerable weaknesses. The argument of the book is long and complex, with many moving parts, and is thus impossible to convey succinctly. In its broad outlines, it goes something like this. Greve begins with a kind of Rawlsian assumption. People in something like an original position – or [*328] faced, in any case, with the prospect of creating a constitution and relying solely on their reason – would choose a particular model of federalism, namely the model often known as “dual federalism,” in which the national and state governments have distinct sets of powers and a national judiciary aggressively enforces the boundaries of allocated power. The reason why rational citizens founding a new nation would prefer this model of federalism, Greve maintains, is that it is the only model capable of sustaining the only thing he believes rational citizens could want: a system of horizontal, interstate competition for productive resources. In such a system of “competitive federalism. . . states compet[e] for productive citizens and firms” (p.170). Such competition is desirable because it “curbs factionalism, disciplines governments at all levels, and seeks to ensure stability through self-enforcing norms” (p.177). Moreover, such a system embraces a proper understanding of what federalism actually is. Its true purpose, Greve explains, is “to alleviate the government monopoly problem,” which it accomplishes by “reducing decision costs and the dangers of government monopoly and exploitation” (pp.6-7). It does this by preventing states from reaching collusive agreements to impede effective competition among themselves, thus “carteliz[ing] the political market” (p.7). On this view, the purpose of the national government is both limited and clear: to “prevent defections and chiseling” by states who must by design compete among themselves (p.8). This is of course a sophisticated and highly contemporary model of political economy. The Framers, Greve concedes, did not have these concepts, but they nevertheless succeeded in creating a Constitution that, properly understood, conforms to such a model. For example, states competed vigorously among themselves, during the early decades of the republic, for corporate charters (ch. 5). Moreover, for the nation’s first 130 years, Greve argues, the Supreme Court read the Constitution in a way that implemented a model of horizontally competitive dual federalism. Consistent with the model, states tried repeatedly to cheat by making collusive, anticompetitive agreements among themselves or with Congress, but the Supreme Court repeatedly beat them back. To this end, it developed and deployed a proto-jurisprudence of free interstate competition which later blossomed into the jurisprudence of the dormant commerce clause. It aggressively expanded diversity jurisdiction to bring state cheating and monopolistic exploitation of private parties within the reach of federal courts. And it developed under the regime of Swift v. Tyson a general federal common law governing business relations that imposed centralized rules of economic competition that Congress lacked the institutional capacity to produce. By the time of the New Deal, however, much had changed. Sectional divisions that had previously impeded interstate collusion gradually disappeared. The slow knitting together of a national economy provided new and constant opportunities and temptations for states to attempt to exploit, rather than to compete to the benefit of, one another’s citizens. A political tide suddenly made Congress an effective agent of change. With the elements in place, the constitutional inversion of Greve’s title [*329] occurred when the New Deal Court finally ditched the old model and began to implement a completely different one. The new model, Greve asserts, was the complete opposite of the original one: a cartel model that, through various means, allowed states to collude among themselves and with the national government to increase their extraction of rents from productive enterprise. The Court’s main contributions to the legal institutionalization of this system included its adoption of a posture of deference toward all government power, whether exercised at the state or national level, and a loosening of dormant commerce clause constraints on state power. Some of the key errors that Greve assigns to the Court include the decision in Erie Railroad v. Tomkins, which undermined a kind of centralized control over commercial law that kept states from cheating; the doctrine in federalism jurisprudence of protecting the interest of “states as states,” a move that Greve contends institutionalized and gave effect to states’ interests in expropriating productive resources; and the deferential upholding of spending conditions, which Greve argues are generally imposed by Congress not to protect national interests but at the behest of states to cement and insulate anticompetitive arrangements. The result, Greve argues, is a form of federalism that would have been chosen not by the people who wished to benefit from it, but by the states, seeking to advance their interest as “autocratic revenue-maximizers” (p.90). These mistakes, Greve continues, were extended and deepened later in the twentieth century by the Supreme Court’s rights revolution, emerging practices of fiscal federalism, and a cooperative model of regulation consisting of a centrally imposed floor with the possibility of more severe regulation by the states. The result, he concludes, is a system in which decentralization, uncontrolled from the center, has detached authority from accountability, leading to a set of fiscally and economically unsustainable policies in which governments overspend and overregulate, attempting to finance their addiction by preying on productive enterprise, an unstable and unsustainable arrangement. Instead of the benign original scheme, what we have given ourselves is “an unsustainable entitlement state” (p.262) with a “proliferation of uncoordinated, semiautonomous power centers” that compete with one another to regulate interstate commerce not to preserve a competitive marketplace, but to levy exactions on it (p.263). Taxing authority, Greve continues, has been detached from spending authority inducing moral hazard (p.280), and as a result, “[p]roducts and profits disappear in hellhole jurisdictions” (p.328). This is, to be sure, a conservative argument – as one might expect from the Searle Scholar at the American Enterprise Institute – yet Greve is no ordinary conservative. Indeed, a substantial part of his agenda in this book consists in distinguishing himself from contemporary, mainstream constitutional conservatism, which he does in numerous respects. These include his preference for a high degree of national centralization of economic and fiscal policy; a deep skepticism of state autonomy; and his rejection of the “balance” model of state and national power, which is to say that he rejects the [*330] mainstream conservative framing of the problem with American governance as an imbalance characterized by excessive national power. Most significantly, he rejects originalism as a method for achieving a proper understanding of the Constitution. One might almost say that, like many contemporary conservatives, he wishes that the twentieth century could be repealed, but unlike most conservatives, the golden age he would restore is not the late eighteenth century, but the late nineteenth. As not many tend to think of the Gilded Age as the apotheosis of American civilization, one is tempted eventually, as the argument unfolds, to ask what exactly Greve is in favor of. He says surprisingly little, at least directly, about the normative baseline against which he finds modern federalism jurisprudence wanting. Perhaps the closest he comes is a passing statement to the effect that the original Constitution’s “winning formula” was “vast scale, free trade, and competition at home; mercantilism and protectionism abroad” (p.88), though it is never clear whether this is meant merely as description or as normative praise. It is perhaps easier to figure out what Greve approves by examining the lengthy list of things he seems to find contemptible, at least if expressions of derision or mockery are any indication. Such a list appears to include the Progressives, “New Dealers,” Erie, the Legal Realists, redistribution, the “race-to-the-bottom” metaphor, campaign finance regulation, human rights floors, entitlement programs, the plaintiffs’ bar, and the regulation of business. One is left with the impression that Greve’s normative baseline is something like a world of completely unregulated markets of the kind that might be produced by unrestricted competition among states for businesses, with the predictable underproduction of public goods remedied centrally by Congress, a body that, according to Greve, is by clever design incapable of agreeing on anything other than the furniture of a minimal state. Ultimately, perhaps, what Greve may most disapprove is democracy. For him, the basic problem of the Court’s New Deal turn was “to make the Constitution itself more responsive to democratic demands” (p.178). Many of the pathologies of the modern state that he accurately describes could just as easily, and probably more plausibly, be described as pathologies not of federalism, but of responsive democratic self-governance. The problem may not be that we need to find a way to prevent states from acting out, but that we need to prevent democratic majorities from doing so, something that has proven far more difficult to control since, well, the demise of the Gilded Age, the rise of Progressivism, and the advent of the New Deal. The turn to individual rights, which Greve deplores, is part of the solution to this problem, but of course it is true enough that a rights-based solution is needed only because the Constitution’s original structural protections for individual liberty did not do an adequate job. The book’s greatest strength is its inventive, elaborate, and unusual readings of now obscure nineteenth century cases, and the author’s ability to marshal seemingly disparate, narrow, and highly technical bodies of law to support contentions of much broader [*331] scope. Among its greatest weaknesses, I would name two. First, the book does not invite the reader into dialogue, but instead actively discourages it through a practice of importing at every turn, without explanation or justification, huge constellations of assumptions the failure of any of which could presumably alter the ultimate plausibility of the argument. In this sense, it does not seem aimed at persuading a general audience that includes possible skeptics, and indeed this impression was strengthened by what seemed, at least to me, a frequent whiff of Straussian ellipticism throughout the text, as though things intended cannot safely be stated forthrightly. The book thus reads for the most part like part of an ongoing internal debate within modern conservatism, much of which may be unintelligible to general readers. At the end of the day, however, the book’s greatest flaw is the author’s self-indulgence. He cuts himself every conceivable break, but his rhetorical foils none at all. He issues many sensible caveats, but then proceeds to run far beyond them. For example, he explains that he doesn’t purport to relate history as it actually occurred, but then makes extremely strong historical claims. He concedes that the Framers did not really have the conceptual categories in which he describes their work, but then proceeds to attribute his favored constitutional structures to them. He grants that a conception of states as “revenue maximizers” is only a “modeling assumption” (p.4) but then proceeds to take his own assumption as the full truth, or at least the only relevant truth. He concedes that the emergence of a national, integrated economy created difficult problems for the eighteenth-century constitutional template, but then proceeds to criticize the judicial responses as though these problems didn’t exist. One thing one may say with confidence about the author is that though he may be wrong, he is never in doubt. He seems always skeptical of the motives, assumptions, and arguments of others, but never of his own. And that, in the end, is what makes this book closer to a polemic than a balanced, scholarly intervention. That doesn’t mean the book doesn’t contain numerous illuminating insights, but the conscientious reader is called upon constantly to supply the skepticism that the author does not, and to question constantly whether the book’s arguments actually support its conclusions. Erie Railroad v. Tomkins 304 U.S. 64 (1938). Swift v. Tyson 41 U.S. 1 (1842). Copyright by the Author, James A. Gardner.